Item is a photograph taken in the Public Health Clinic. 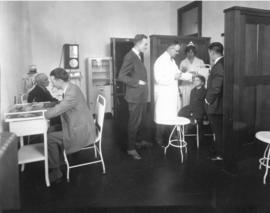 The photograph shows a young girl being examined by a doctor and a nurse while two men observe. Two other men are sitting in the room. Item is a photograph taken in the Public Health Clinic. The photograph shows a wide hallway and a waiting room where several people are sitting or standing. Item is a photograph taken in the Public Health Clinic. 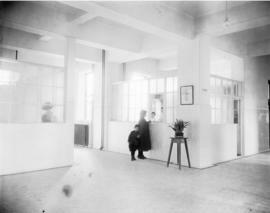 The photograph shows a wide hallway in the clinic, where a woman and a child are standing and talking to a receptionist behind a window. Item is a photograph taken in the Public Health Clinic. 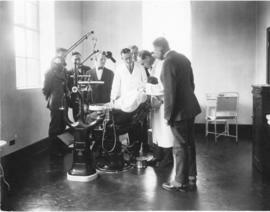 The photograph shows several men observing a dentist who is examining a patient in a dentist's chair. 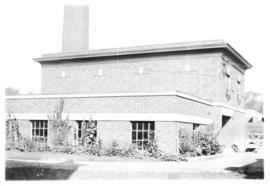 Item is a photograph of the Public Health Clinic building at Dalhousie University. 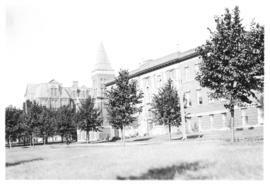 Item is a photograph of the Public Health Clinic and Forrest Building at Dalhousie University. 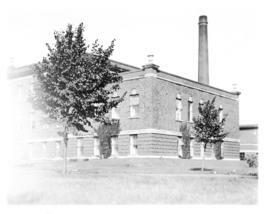 Item is a photograph of the Public Health Clinic and Forrest Building at Dalhousie University. 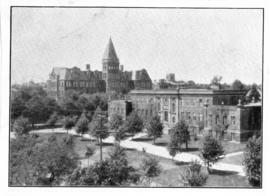 The photograph was taken by a student for the yearbook. 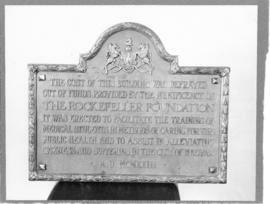 Item is a photograph of the cornerstone of the Public Health Clinic at Dalhousie University. 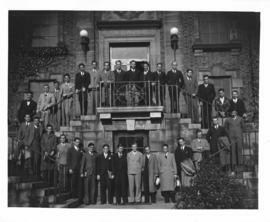 File contains photographs taken in the Outpatient and Public Health Clinic in Halifax, Nova Scotia. 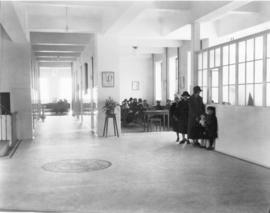 The photographs show a dental examination, a girl having a medical examination, a waiting room, and a hallway in the building.